For 18 months Inspector General Michael Horowitz and his staff of 400 people worked on this much-anticipated report that was finally released to the public on Thurs. June 14, 2018. Its release was previously scheduled for early 2018, then March, April, and May 2018. After many delays and redactions by the Department of Justice (DOJ) and the Federal Bureau of Investigation (FBI), IG Horowitz announced the report would be made public at 2:00 pm EDT on June 14, 2018, Washington, D.C. (We will shortly examine the astrological chart of this moment, as well as two other relevant charts.) Two hours beforehand, select individuals were allowed advance review of the report, and indeed some key items appeared on alternative media for months prior to mid-June 2018, when the final report was released. In preparing the report, the IG’s office interviewed over 100 witnesses and reviewed well over 1.2 million documents. Though the focus of the IG Report was intended to be on the Clinton email probe, the FBI’s handling of two major investigations came under scrutiny, since the same FBI team investigating the Trump-Russia collusion from July 2016 for nearly two years was also previously investigating Secretary Clinton’s mishandling of classified documents and illegal use of a private email server while Secretary of State. Documentation within the report indicates that the FBI exonerated Clinton well in advance of her official interviews and the public announcement of her exoneration July 5, 2016 by then-FBI Director James Comey. Comey was subsequently fired by President Trump on May 9, 2017 for his handling of the Clinton email and server investigation. Both Deputy Attorney General Rod Rosenstein and Attorney General Jeff Sessions had also recommended to Trump that Comey be fired. In general, IG Reports have a reputation for whitewashing, so the watered-down nature of the conclusions at the end of this IG Report is not surprising. What is surprising is the extent to which the conclusions ignore the massive amount of evidence presented, including the extreme political bias at the FBI and DOJ, and the double standard of how the two investigations were conducted. This becomes very obvious over the course of the 568-page report. In a very weak and narrow investigation Hillary Clinton clearly received preferential treatment for any alleged criminal wrongdoing, including willful destruction of evidence (her computers, cell phones, and emails), while the Trump-Russia collusion probe was conducted with a vengeance, and by a team of all pro-Clinton investigators with extreme anti-Trump political bias. Despite lack of legitimate evidence to warrant conducting surveillance on Trump and his team, this was done from as early as fall 2015 and officially by July 2016, when the Trump-Russia investigation accelerated. The OIG is still waiting for documentation on how and when it began. FBI focus on the Trump-Russia probe was so center stage by then that they even delayed examining a new cache of Clinton emails from Anthony Wiener’s laptop – 675,000 of them – obtained through a search warrant by the N.Y. Police Dept. Sept. 26, 2016. (IG Report, p. 295) Strzok’s text on Sept. 28, 2016 says a team would go the next day to review the new trove of emails. (Previously, only 30,000 Clinton emails were made available to the FBI.) Yet Strzok and Deputy Director McCabe sat on this new key evidence until a few days before the election, when the Clinton case was briefly re-opened and closed. According to then-FBI Director Comey, McCabe did not notify him about it until Oct. 27, 2016. By July 2016 the FBI team had achieved its initial goal of protecting Clinton, as stated in various text messages, notably those of lead investigator Peter Strzok, who began the Trump-Russia probe. The “Russian dossier” surfaced soon afterwards, which – thanks only to Judicial Watch – was months later revealed to be funded by the Clinton campaign and the Democratic National Committee (DNC). The Obama administration and his DOJ then used the “Russian dossier” to obtain FISA warrants for surveillance on Trump and his team, reportedly unaware of the dossier’s true source. Since the “Russian dossier” could never be substantiated – as it was fabricated – the entire investigation has been renamed “Spygate” by Trump and his allies. Its stated purpose was to find proof of Trump-Russia collusion to change the outcome of the 2016 election, but no such proof was ever found after two years, and none of the charges yet filed by Mueller’s prosecutors relate to election interference by U.S. citizens. Even so, this topic has dominated liberal leftist mainstream media (MSM, which is 95% of big media) for much of the last two years. Conversely, MSM’s reporting on either the latest IG Report or the subsequent Congressional hearings has been minimal, to say the least. And if Democrats were counting on the Mueller probe to result in Trump’s impeachment, those hopes are so far disappointed. But as if to avoid facing this reality and to continue the anti-Trump hysteria through the mid-term election (Nov. 6, 2018), MSM immediately pivoted in mid-June 2018 to focus on immigration issues at the U.S. southern border. There were even louder cries by Rep. Maxine Waters and others for Trump to be impeached, along with public statements urging Democrats and those on the Left to harass and attack Republicans, Trump officials and supporters both in public venues and at their homes, and this has expanded to include ICE officials (Immigration and Customs Enforcement. )[ii] We will see later how this is connected astrologically with the Mars-Ketu conjunction in sidereal Capricorn June 13, 2018, and with the power of the New Moon the same day to bring explosive Mars energy into the summer months, along with three eclipses between July and Aug. 2018. This evokes fiery energy, but also the potential for major innovations. It took until early June 2018 to obtain these text messages (the DOJ had withheld them), and many months for the OIG to retrieve many of them. The FBI and the DOJ would not release them either to Congressional oversight committees or to the Inspector General, both of which have Constitutional responsibilities to oversee the workings of the FBI and the DOJ. Checks and balances of the U.S. government require Congressional oversight over both the Executive and Judiciary branches of government. Let us see how the astrological chart reflects the release of one of the IG’s most high-profile reports, one that describes actions damaging “to the heart of the FBI’s reputation for neutral fact-finding and political independence… and [which] cast a cloud over the organization.” (IG Report, p. 497). Both FBI Director James Comey and Attorney General Loretta Lynch also receive scathing coverage. And yet – remarkably – the Report’s brief formal conclusion minimizes the massive amount of compelling evidence presented. CHART GUIDE: Please click here for a brief review of how to read a South Indian chart. The official release of the IG Report to the public was at 2:00 pm EDT, Thursday, June 14, 2018 in Washington, D.C. It shows us right away the shifting dual nature of the event, with the dual sign Virgo rising and 3 planets in dual signs: Moon, Mercury and Saturn. (Underlined planets are in retrograde motion, and all positions are in the sidereal zodiac, Lahiri ayanamsha.) Virgo is the sign of both conflict and purity. The Vedic symbol for Virgo is the Virgin, who is usually pictured standing in a boat, with a shaft of wheat or corn raised above in one hand and a torch of fire in the other. “All the meanings of the 6th house come into the 6th sign of Virgo: debt, disease, enemies, and competitors. Thus, Virgo can bring struggle in various forms, including with health, conflict, and sacrifice. With Virgo, or 6th house emphasis, we are dealing with all these issues, some of them naturally difficult – as they bring discord and the collision of opinions. Virgo Ascendant or emphasis can be argumentative and overly critical, depending on the strength and interactions of Mercury and Mars, but also highly skilled in debate. Virgo emphasis often requires the destiny to deal with dissension of varying degrees, including wars, or correcting wrongs – through military means or through legal or medical procedures. This includes arbitration or mediation.” The author, In Search of Destiny: Biography, History & Culture As Told Through Vedic Astrology, 2012, Chapter 8, pp. 321-322. In many ways we can see how Virgo is the perfect Ascendant sign for the release of this controversial report, which indeed was so controversial that the DOJ and FBI sought for months to keep many parts of it from being made public, and is still fighting off Congressional demands for more documents. Virgo is ruled by Mercury, which is well placed in its own sign of Gemini at the top of the sky, the 10th house. We can assign Mercury to the Inspector General and the IG Report (as Ascendant lord of the IG Report release chart), and Jupiter to the opposition, or to those being investigated (7th house lord). With Mercury almost exactly on the 10th house cusp, it has prominence and assures that the content of the IG Report will be aired in public, as it was for the next several weeks of Congressional hearings, and hearings that could continue for some months. However, Saturn at the exact 4th house cusp of the chart opposite Moon and Mercury shows the extent to which delays and obstruction played a part in this report being completed at all, and hints at how the public (Moon) would have trouble digesting some or all of its contents. Saturn also closely aspects the Ascendant and thus demands that the Truth be told. And though the Inspector General cannot prosecute, he can expose what has happened, galvanizing a process of potential prosecution in the future. Though well placed in the chart and strong in an angular house in its own sign (a Maha Purusha Bhadra yoga), Ascendant lord Mercury suffers from being close to the Moon and opposite Saturn. While Mercury’s ability to discriminate can be further structured and organized by Saturn’s influence, the influence of the Moon is less positive. Close contact between Mercury and the Moon shows a tendency for the public (and the report) to be distracted by emotions in the light of the facts, making it difficult to separate the two. Emotions are connected with likes and dislikes, and can descend into prejudice. Tr. Moon and Mercury both in Ardra nakshatra indicate some turbulence and suffering are involved in several arenas – the contents of the report, and preparing and assessing those contents. Ardra is ruled by the deity Rudra, god of storms and wild animals. Ardra in Sanskrit means “moist” and is symbolized by a teardrop. But Saturn’s opposition to Mercury and Moon also keeps demanding that the report abide by the rules and convey the information required. Oddly enough, it does both, and therein lies the paradox. This may account for why the Inspector General himself was constrained to draw conclusions that do not truly mirror the contents of the report, and why others (much of MSM) are just as happy to accept his conclusions – since the Truth (Saturn) contained in the report may be difficult for them to digest, especially for those still not accepting the 2016 election results. There is also a Jupiter aspect to this Moon and Mercury, and as a classical benefic symbolizing Justice and Dharma (right action), Jupiter’s influence shows that there may yet be a positive outcome to this report. But a positive outcome for whom? Those wishing to exonerate senior officials of the DOJ and FBI and protect the reputation of both organizations will want to see this Jupiter as doing just that, while also shielding those who have succeeded so far in saving Hillary Clinton from prosecution and pressing to continue the Trump-Russia probe – with the aim of bringing on Trump’s impeachment and downfall. But by mid-June 2018 most senior officials at the DOJ or FBI who were involved in these projects have either been fired or resigned, and some are out of office – which does not prevent them from being prosecuted in the future. These facts seem to hint at the IG Report’s unfolding outcome. Meanwhile, some previous IG Reports have also documented pro-Clinton bias at the FBI and DOJ, with the DOJ instructing Deputy Director Andrew McCabe to shut down the FBI’s ongoing investigation into the Clinton Foundation (Aug. 16, 2016), despite substantial evidence of guilt. Also, in summer 2015 Attorney General Loretta Lynch allegedly promised Clinton political director Amanda Renteria that she would keep a short leash on the FBI investigation into Clinton’s emails. DOJ Intercepts containing Lynch’s messages have thus far been withheld. In any case, Obama was ardently supporting Hillary Clinton and had signaled that he did not want her charged. The IG Report chart contains a Dhana yoga of wealth, with 2nd and 9th house lord Venus in the 11th house in Cancer. This shows there has been ample funding for this IG Report, including with Jupiter, planet of abundance, in the 2nd house of financial income (as well as speech); thus, the voluminous contents of the report due to Jupiter’s trinal aspect to Mercury, bestowing an abundance of words or communication. With Mercury representing the Inspector General and the IG Report and Jupiter representing those being investigated (7th house lord), we note that Jupiter has a less prominent position in the Rashi chart (2nd house), though it aspects Mercury and Moon in the 10th house, seeming to support the OIG and work with them from behind the scenes. However in both the Rashi and Navamsha charts this Jupiter is ruled by planets on the eclipse axis, rendering Jupiter less reliable or predictable. In the birth chart, Jupiter is in Libra, ruled by Venus in Cancer conjunct Rahu. In the Navamsha chart Jupiter is in Aries, ruled by Mars in Taurus conjunct Ketu. We assess the Navamsha chart to confirm or deny any increase in strength or fortune of those planets from the birth chart. 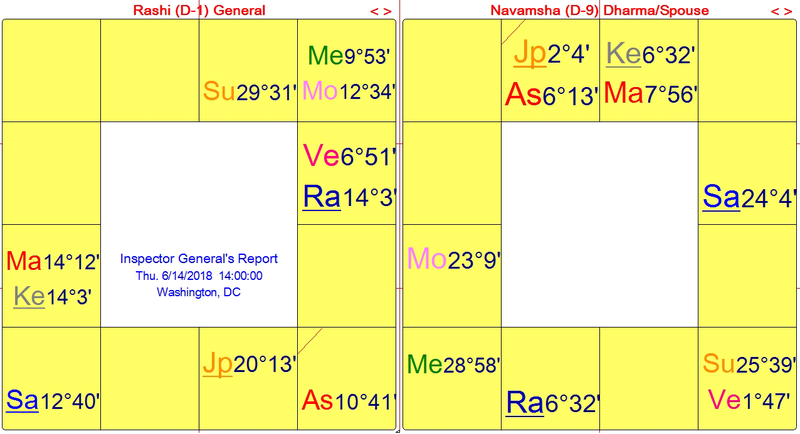 Navamsha Jupiter does improve its house position and plays an even stronger role, moving from the 2nd house in the Rashi to the Navamsha Ascendant in Aries, where it is Digbala, the strongest possible angular house position. Jupiter also has inherent strength by being close to its Stationary Direct degree (1° orb). This in turn shows the inherent power of the DOJ and FBI. Meanwhile, Navamsha Mercury retains its power by being in the 9th house in Sagittarius, with its house lord Jupiter Digbala in the Ascendant aspecting its own house. Added good news for Mercury is that Navamsha Moon and Mercury are no longer in contact in the same house, allowing greater opportunity for the true contents of the IG Report to be separated from any emotions (i.e. political bias, one way or the other). Navamsha Moon repeats in the 10th house closely opposite Saturn, as in the Rashi chart, but this time in Capricorn, owned by Saturn. Navamsha Moon and Saturn also form a Parivartana yoga, a mutual exchange of signs and energy. This makes for a very conscientious Moon, dutiful and loyal, and may indicate a public (Moon) that is committed to searching for the Truth (Saturn). The question could be asked whether the IG’s loyalty is to the American people or to the senior officials at the DOJ and FBI who are being investigated. In writing this report the Inspector General may be split between both those loyalties, though his ultimate duty as Inspector General is to serve the public, and in doing so to execute his Constitutional responsibility to provide oversight of the workings of the FBI and the DOJ. The Navamsha chart supports the latter outcome. Mars is the planet of conflict and of course could be a karaka (significator) for the FBI as a law enforcement body. However, both the DOJ and the FBI are being investigated here, so in terms of this chart are strictly speaking both symbolized by Jupiter. 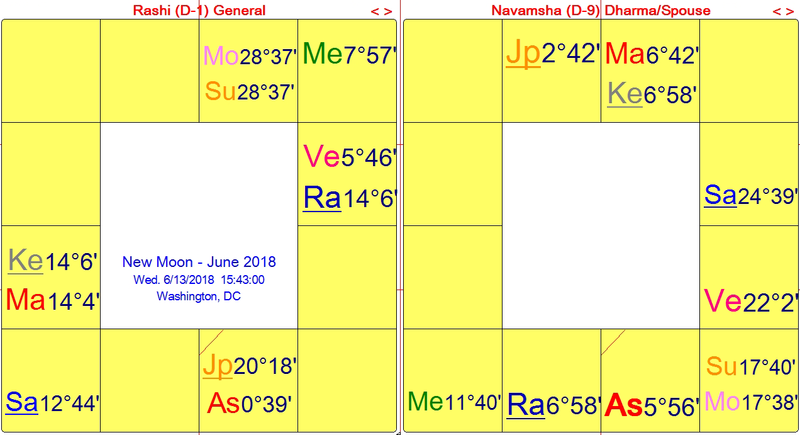 And while Jupiter is strong in the Navamsha Aries Ascendant, its sign is ruled by Mars in close conjunction with Ketu in both Rashi and Navamsha charts, making it more unpredictable. An exact Mars-Ketu conjunction occurred the day before the IG Report was released, in close synch with the New Moon also on June 13, 2018. Additionally, Mars is both exalted and near its Stationary degree, reflecting how heated are the reactions to investigating the FBI and the DOJ, even eliciting an angry defense from Eric Holder, Obama’s Attorney General, 2009-2015, who is considering a run for U.S. President in 2020. These factors indicate that the FBI and DOJ will most likely fight back, and have thus far resisted cooperating fully, while claiming to comply with the demands of the IG and the Congressional intelligence committees. Both organizations have fought for over a year to obtain information from both the DOJ and the FBI that they are entitled to receive. As of June 28, 2018, the House has voted that if its demands for the remaining documents are not met in 7 days, they will move to impeach Deputy Attorney General Rod Rosenstein, a truly dramatic and unprecedented state of affairs. Even so, the OIG and House committees will no doubt continue following leads, aided by the information obtained thus far from the IG Report. All planets except the Moon repeat in the same sign, while tr. Moon moves into Gemini within 2 hrs 13 min. the same day and tr. Sun enters Gemini on Friday, June 15th at 2:07 am EDT. With Mars and Jupiter strong in angular houses there can be an increase in the intensity of one’s beliefs combined with a willingness to take actions that are either very courageous, or reckless and uncivil. Both tr. Mars and tr. Jupiter are strong near their respective Stationary degrees. Mars turns Stationary Retrograde on June 26, 2018 at 15:07 Capricorn. Tr. Jupiter turns Stationary Retrograde on July 10, 2018 at 19:14 Libra. A planet travelling within one degree of its Stationary degree has added power, especially if that planet is exalted, as with Mars, which continues in Capricorn through Nov. 6, 2018. Several key planets or points are in Mars-ruled nakshatras: Ascendant, Sun and Moon – giving exalted Mars conjunct Ketu a great deal of power through Mars ownership of the nakshatra. Sun and Moon are in Mrigashira nakshatra – symbolizing a deer’s head and a hunt or major quest. The Ascendant is in Chitra nakshatra, symbolizing a shining jewel. Mars and Ketu come into an exact conjunction on the same day as the New Moon (June 13, 2018) at 19:11 EDT at 14:06 Capricorn, and again on July 18, 2018 at 12:18 Capricorn, 5 days after a Solar eclipse at 26:34 Gemini and 9 days before a Total solar eclipse at 10:38 Capricorn. Mars-Ketu is an explosive, fiery and revolutionary combination which becomes even more extraordinary due to Mars in its sign of exaltation. Mars-Ketu can manifest both positively or negatively, but if directed properly it has an enormous capacity to bring needed change and innovation. With Moon in Mrigashira (Mars-ruled nakshatra) and Mars in Shravana (Moon-ruled nakshatra), there is a powerful Nadi yoga – an exchange of nakshatra lords. Moon-Mars combinations can bring financial wealth. They can also bring a heated mind and emotions. Pluto (not shown in these charts) is especially relevant in the last few degrees of Sagittarius, where it causes major changes in current trade and immigration laws across the world. The Gemini-Sagittarius axis can be seen as the nervous system of the world, affecting the whole balance of communications, trade and diplomatic relations between nations. Tr. Pluto is in sidereal Sagittarius for 15 ½ years: Feb. 8, 2005 to Feb. 24, 2020; June 30 to Dec. 30, 2020. In most of these last 2 ½ yrs. in Sagittarius it will be Vargottama, i.e. in the last 3:20 of the sign, and thus strengthened by repeating in all the many harmonic or varga charts. Pluto has been in a close opposition (3° orb) to the USA Sun at 22:38 Gemini for most of 2017, with two close Stations on April 20, 2017 and Sept. 28, 2017. One last Pluto Station occurs within a 3° orb range opposite the USA Sun, and this is on Oct. 1, 2018 at 24:39 Sagittarius. Using the Kelleher USA chart (8:59 Sagittarius Ascendant), I have written and lectured extensively on this topic. In my article Deep State vs. Head of State (April 27, 2017), I describe how President Trump has faced severe opposition from the Deep State, which – comprised of numerous shifting organizations and intelligence agencies including the CIA – made their preference for Hillary Clinton clearly known both in the lead-up to the 2016 election and in the subsequent months and years of the Trump administration. This is also reflected in the IG Report of June 2018, and amplified astrologically by the Solar eclipse July 12, 2018 at 26:34 Gemini. This eclipse resonates closely with tr. Pluto at 25:53 Sagittarius on eclipse day as well as Pluto’s Stationary Direct degree at 24:39 Sagittarius on Oct. 1, 2018 opposite the USA Sun at 22:38 Gemini. BIO: Peter Strzok was educated at Georgetown University, where he obtained a B.A. degree in 1991 and a Master’s degree in 2013. He served in the Army before entering the FBI in the 1990s as an intelligence research specialist. By July 2015 he rose to become Section Chief of the FBI Counterintelligence Division. Strozk is married, and has no children. As we know, Strzok was the Lead FBI investigator on both the Clinton email and Trump-Russia probes. He conducted the interview with Clinton regarding her email server, which resulted in no charges being filed. He also conducted an unscheduled interview of General Michael Flynn in Jan. 2017, which resulted in Flynn’s forced resignation after only 24 days in office and many months of Flynn fighting lawsuits that bankrupted him and his family. Strzok allegedly altered the FBI interview reports (the 302s) in both investigations, one of which lightened the case against Clinton, the other of which deepened the case against Flynn, accusing him of lying to FBI officials when his FBI interviewers had not found him to be lying. Flynn had also been illegally surveilled and “unmasked” as a private citizen by the Obama administration, adding to the subterfuge of the case. Special Counsel Robert Mueller has once again postponed Flynn’s sentencing until late Aug. 2018, while some say the case should be thrown out altogether due to how Flynn was a target and victim of entrapment. Strzok played a key role in decision-making in both these high-profile cases. This included sitting for almost a month on a trove of 675,000 Hillary Clinton emails that surfaced on Anthony Wiener’s laptop in an unrelated case from the NY Police Dept. The NYPD acquired the emails through search warrants on Sept. 26, 2016 and the FBI first had access to them on Sept. 29, 2018, with full availability by Oct. 4, 2018. FBI Director James Comey claims he was not informed of it until Oct. 27, 2016, and this led to the Clinton case being briefly re-opened and closed just before the presidential election Nov. 8, 2016. Comey said his earlier decision to clear Clinton on July 5, 2016 was not impacted by the new batch of emails. In Aug. 2017 the FBI first became aware of the volume and content of text messages on FBI-issued phones between Strozk and his lover, Lisa Page. Strzok was then transferred to FBI’s Human Resources Division. (This transfer was kept out of the news for several months.) Although the IG Report was only released June 14, 2018 many of the text messages were in the public eye for months. As a result of the latest IG Report, citing Strzok’s bias, partisanship, “poor judgment,” and “gross lack of professionalism,” Strzok has already faced some repercussions, though remarkably enough – he is still not fired from the FBI as of June 29, 2018. Here is a brief time-line since the IG Report’s release June 14, 2018. June 15, 2018: Strzok is formally escorted out of FBI headquarters, putting him under Security Review. June 21, 2018: Strzok loses his Security clearance, but is still not fired from the FBI. June 27, 2018: Strzok appears before the House Judiciary Committee – behind closed doors – to explain his part in the FBI investigations covered in the IG Report. Committee members complain that Strzok avoided a lot of questions, citing “security concerns” and “classified information,” and that he refused to answer other questions based on the advice of FBI Counsel, who was also in the room. However, House Committee members vow to get Strzok back soon before an Open Public Hearing. June 28, 2018: In a televised House hearing, Deputy Attorney General Rod Rosenstein agrees that the FBI made many missteps in their investigation of Clinton’s emails and private server. Rosenstein also agrees that extreme bias was shown, not only by Peter Strzok and Lisa Page, but by other FBI officials working on both investigations who were identified in the IG Report. The House Committee confirms that it wants to learn more about what happened when Strzok moved from being head of the Clinton email investigation to the head of the Trump-Russia collusion investigation. House Judiciary Chairman Goodlatte refers to the extreme stonewalling of information from the FBI and DOJ, though now improving somewhat. SOURCE: Wikipedia gives the month/day/year of birth as March 7, 1970, but no listing for the place of birth. This is a speculative rectified chart by the author, as the birth data for Peter Strzok is incomplete and not publicly known up to now. Wikipedia lists his secondary education at St. John’s Preparatory School in Collegeville, MN. Thus, Minnesota appears to be the likely birth place. A default location of Minneapolis, MN is used here, along with a time close to 12 noon which also coincides with an exact Solar eclipse. ASTROLOGY: Though a speculative rectification, this chart has some merit with an Ascendant of 9:13 Gemini, close to opposite the USA Ascendant of 8:59 Sagittarius (Kelleher chart). Having served in the U.S. Army and the FBI, there is obviously some strong connection and loyalty to his country of origin. With someone who has reached a high career position we expect to see strength in Houses 9 and 10, and also perhaps House 11. The Ascendant lord should be strong and well placed. Ascendant lord is Mercury, indeed strong in the 9th house in Aquarius, along with 3 other planets: Rahu, Moon and Sun. Venus is exalted in the 10th house, which often brings a kind of obsessive devotion to one’s career, along with career success and visibility. Also bringing distinction to this chart career-wise is Sun-Moon in the 9th house, 10th lord Jupiter in the 5th house aspecting four 9th house planets (including Sun and Moon), and an almost exact Jupiter-Saturn opposition, giving entrepreneurial abilities. This occurs on the day he was born, as does a Solar eclipse at 23:17 Aquarius. And though we do not know the house positions from an established Ascendant, we can say for certain that the JU-SA opposition is in Houses 3 and 9 from Sun and Moon, which is very good, and we have three planets either swakshetra (own sign – Mars in Aries), exalted (Venus – in Pisces), or debilitated (Saturn – in Aries, receiving correction from Mars in Aries, thus Neecha Bhanga Raja yoga), bestowing on Saturn increasing strength over the years. 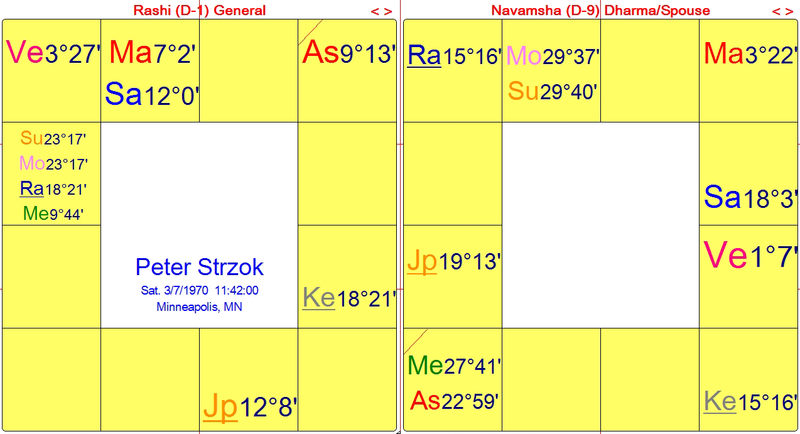 Using this birth time, it puts his graduation from Georgetown University in the Saturn-Venus period (Vimshottari dasha), and his entry into the FBI also in Saturn Dasha, which runs up through late March 2001. So there is a great deal of strength and success shown with just these combinations; and the closer he is born to the Total eclipse, the more likely he is to experience some major drama in the public eye, especially if those planets are placed above the horizon, as they are here. Strzok is certainly in the public eye in 2018 and has been on the public radar ever since Dec. 2017, when the true cause of his FBI transfer became more widely known, as well as some sense of his pivotal role at the FBI. Tr. Saturn entering sidereal Sagittarius Oct. 26, 2017 would have entered his 7th house (of partnership, also open enemies), aspecting his four planets in Aquarius, whatever his Ascendant may be. This puts greater focus and pressure on the workings of his mind and also his marriage and/or close business partnerships (Sun-Moon and 7th house). Using this speculative rectified chart, which is also close to the 12 noon default time often used with unknown birth times, there are some compelling similarities to the chart of the IG Report release on June 14, 2018: 1) Jupiter is also retrograde in Libra; 2) Jupiter aspects both Moon and Mercury; and 3) Moon and Mercury are in the same sign and house, also an AIR sign, in this case Aquarius rather than Gemini. Moon in an AIR sign shows ease of flow of communication and information, and the ability to digest large amounts of information, especially with an aspect from Jupiter. With Moon and Mercury both in an AIR sign, there is an exaggeration of the above, with seemingly no limits on the amount of data that can be absorbed and discussed. This is perfect for an intelligence research officer! However, with both Moon and Mercury in AIR, the challenge is in not being able to discriminate between the facts and one’s emotions, while assuming one is more than capable of doing so. This latter quality derives from Moon in a fixed sign (Aquarius, in this case), combined with a strong mental focus on human interaction, if Gemini is the correct Ascendant. If so, Gemini also has a natural versatility and flexibility. But the flexibility of mind is far less likely with both a fixed Moon and Mercury, and in this case they are afflicted by Rahu. Rahu can eclipse the Moon and cause unsteadiness of mind. This is perhaps why, with Moon in a fixed sign, the person may hang on to a conviction, a way of life, a relationship, you name it – for longer than is useful or warranted. This can be a form of compensation for the ever-shifting demands of the Rahu-Ketu axis, which can destabilize with its ups and downs whenever it is in contact with another planet in the same sign. This same quality is shown to some extent in the IG Report chart, and becomes clear in the chart of the Lead FBI investigator. His voluminous exchanges of text messages with his lover, the FBI lawyer, Lisa Page, all of them on FBI-issued phones, shows how private exchanges can indeed become public and reflect on a premier law enforcement agency, even if government employees are allowed to have their private opinions. The problem, as the public sees it (though the FBI so far may only see it as “a cloud over the organization”) is that Strzok and Page were in lead roles in both investigations, and clearly had a huge personal investment in making sure those investigations had certain outcomes. Their messages and their actions convey this. A more impartial approach would not overlook how Clinton had violated various statutes, including The Espionage Act and 18 USC 1924 (18 U.S. Code Statute 1924): the unauthorized and intentional removal of classified documents by government employees, false and misleading statements. But that would have disqualified Clinton from running for President, and Strzok and Page both assumed she would become President and were committed to that outcome. Democrats say that the GOP is trying to undermine the established system of justice, especially with this IG Report. But Republicans say that the system of justice broke down in 2015-2017, and the Inspector General and Congressional House Committees say they want to restore the reputation of the FBI and the DOJ. House Judiciary Committee Chairman Robert Goodlatte sees it as a positive sign that already many top people at the FBI and DOJ are out or on their way out, with Peter Strzok also most likely on his way out. [i] A Section 8 referral is a report to the FBI about any unauthorized information that may have been disclosed to a foreign power. It arises when there is a compromise of classified information for a variety of reasons, including negligence or inadvertence, but does not assert a violation of criminal law. [ii] Unfortunately, this has already started to happen, and is mirroring actions of well-funded Hard Left terrorist organizations such as Antifa, among others. On June 19, 2018 Kirstjen Nielsen, Secretary of Homeland Security, was harassed at a restaurant in downtown Washington D.C. and later at her home. On June 22, 2018 Press Secretary Sarah Sanders was harassed at a restaurant in Virginia. When she and her family went across the street to another restaurant, the local activist mob followed them there. Sanders now receives Secret Service protection, at least temporarily. On June 26, 2018 Senate Majority Leader Mitch McConnell and his wife Elaine Chao (U.S. Secretary of Transportation) were accosted and harassed leaving a dinner at Georgetown University. On June 29, 2018 a California Democrat was arrested for threatening to kill Federal Communications Commission Director Ajit Pai and his family because he disliked his policies. On June 21, 2018 New York gubernatorial candidate Cynthia Nixon claimed that ICE officials (Immigration and Customs Enforcement) are a “terrorist organization” and that ICE should be abolished. NY City Mayor Bill DeBlasio and NY Senator Kristen Gillibrand quickly joined Nixon in support of this plan. Democrats are proposing more of an Open Borders concept to counter Trump’s more Law and Order approach to enforcing the U.S. national borders and dealing with the increasing influx of illegal immigrants. http://www.dailycaller.com/2018/06/22/fbi-ignored-golden-emails-and-abedin-messages/ June 24, 2018 by Sidney Powell, former federal prosecutor and author of Licensed to Lie: Exposing Corruption in the Department of Justice, 2014.
http://thehill.com/opinion/campaign/393857-what-did-peter-strzok-do June 24, 2018 by Sharyl Attkisson, prize-winning investigative journalist and author of The Smear: How Shady Political Operatives and Fake News Control What You See, What You Think, and How You Vote (2017), and Stonewalled: One Reporter’s Fight for Truth Against the Forces of Obstruction, Intimidation, and Harassment in Obama’s Washington (2014). http://thehill.com/opinion/white-house/393049-the-strategic-blunder-of-trump-as-hitler June 24, 2018 Allan Richarz About the anti-Trumpers now crossing a rhetorical line, simultaneously with the release of the June 2018 IG Report – which has the capacity to focus attention on what really happened with the Clinton email investigation as well as the Trump-Russia investigation. http://thehill.com/homenews/house/394604-house-passes-measure-demanding-doj-documents June 28, 2018 Excerpt: The House … [today] passed a resolution demanding the Department of Justice (DOJ) hand over sensitive documents, in the process delivering a final warning shot to senior officials before conservatives move ahead with more aggressive action against the department. In a 226-183 vote, lawmakers approved the messaging measure, which calls on the DOJ to turn over all of the documents House Republicans have requested related to the FBI’s handling of investigations during the 2016 presidential election. https://willyloman.wordpress.com/2017/08/23/who-is-peter-strzok-and-why-does-it-matter/ 23, 2017 A summary of Clinton/DNC/Obama administration efforts to clench the 2016 election for Hillary Clinton and destroy Trump in advance. https://www.zerohedge.com/news/2018-06-26/house-approves-resolution-demanding-dojfbi-docs June 26, 2018 by Sarah Carter Excerpt: The House Judiciary Committee approved for the first time a resolution Tuesday demanding that Deputy Attorney General Rod Rosenstein turn over all requested documents regarding the FBI’s handling of the Russia investigation during the presidential election after seven days or face possible impeachment or contempt. Copyright © by 2018 by Edith Hathaway. All rights reserved.